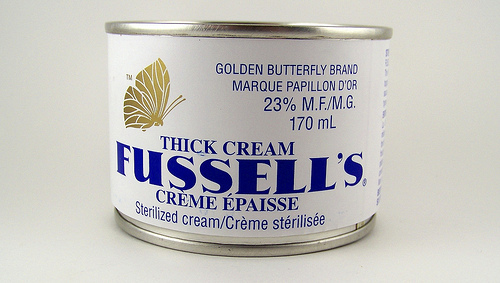 For some reason a discussion of yogurt in food reminded me of this old staple, fussel’s cream! While I loved fresh cream, I can’t say I cared for this back in the day, but maybe I would now. Only problem is I’m not even sure it exists anymore! But Sunday evening’s supper wasn’t complete for Dad without something sweet, with some cream on top. Going off on a tangent here, another thing I only recently noticed or paid attention to, after so many years away, is that we Newfoundlanders are the only ones I’ve encountered that call “canned” products “tinned”. I mentioned at work one day that I had a tin of Pepsi, and they looked at me like I was nuts (well they do that anyway, but this time it was for the tin). Back on topic, and in relation to the title, there was one aspect of this cream that I did like, that was playing with it to thicken the cream. I guess over time the cream started to separate, and my “job” was to shake it to help thicken it. Of course my ideas of shaking may have been rolling it on the floor, using it as a puck in a game of knee floor hockey, and I may even have shaken it occasionally! Anyway, another memory I thought I’d share, now to go find some partridge berry tart and cream! I love the stuff! I still use it on partridge berry pies and tarts. It’s one of the comfort foods that takes me back to our big old kitchen in Britannia on Sunday evenings. We used to have it on tinned fruit, Jello, or even bread and molasses. But, the best cream was real cream from Aaron Pittman’s cows when I was a child, and then from Clarence Williams cows when my daughter was little. Good memories. We used to get cream from Jim Phillips ourselves, but yeah I hear you. Fresh cream and molasses on fresh bread right out of the oven, yum! I was just talking to my mom about this brand of cream a couple of weeks ago. We also enjoyed it on Sundays. Dad would mix a little sugar in it, stir it and we would serve it over fruit. We never knew then that we were supposed to whip it as one does with modern whipping cream. It would have seemed more decadent if we had done that … but your blog brought back some great memories. I’m not sure we knew that either to be honest, but i don’t really recall the eating part as much as the playing!